Is it spring yeeeeeeeet??? I'm hopeful that the gorgeous weather is here to stay in my part of the country; but realistically, I know we are in for at least one more cold snap. And what do you eat when there's a cold snap? Soup! 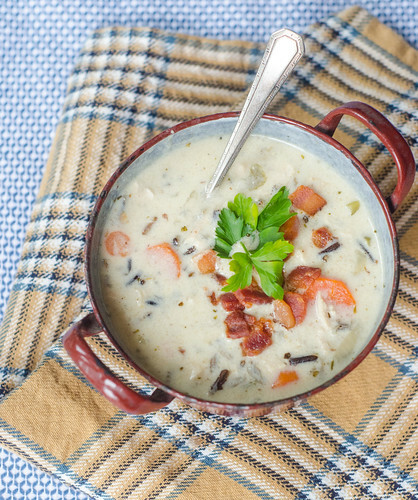 This soup is everything you want in a bowl of comfort food. 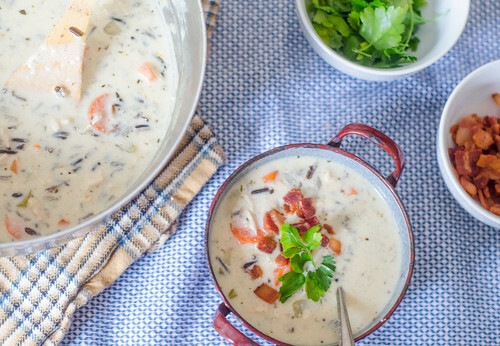 There's chicken, rice, tender vegetables, bacon, and it all comes together in a rich, creamy broth. 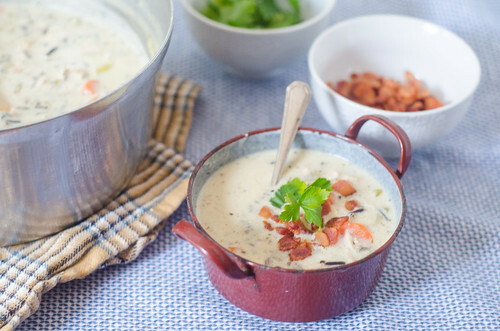 Creamy soups are definitely one of my guilty pleasures, and one that I only indulge on occasion. But this soup is so so worth the splurge. I served this with my buttermilk drop biscuits and fall harvest pear salad, and it was a great meal on a cold and rainy night. And then subsequently, I enjoyed the leftovers for lunch for the next 3 days. It reheats well, is warm, comforting and delicious, and makes enough to feed an army (or a family of 6, and then some!). 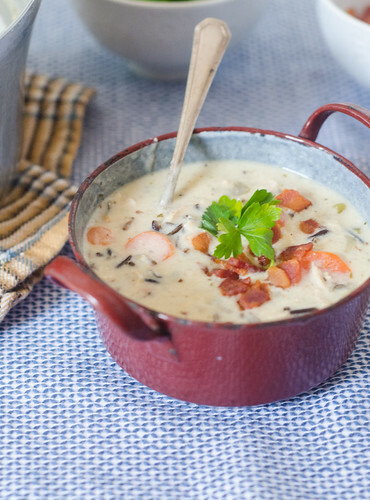 Go ahead and put this on your menu the next time the weather is cold and dreary. It feeds the body and warms the soul. barely adapted from Elly Says Opa! Heat a large pot or Dutch oven over medium-high heat. Add the bacon and cook, stirring frequently, until it is crispy and has rendered most of it's fat. Use a slotted spoon to transfer it to a paper towel-lined plate and set aside. Drain all but 1 tablespoon of the fat, and return the pot to the stovetop. Decrease the heat to medium and add the carrots, onions, celery, and garlic. Cook until the vegetables begin to soften, about 3 to 5 minutes, stirring often. Stir in the dried thyme, 3/4 teaspoon of salt, 1/2 teaspoon of pepper, and the bay leaf. Add the chicken broth and wild rice and bring to a low boil. Cover, reduce the heat, and simmer 35 to 40 minutes, or until the rice is almost cooked through, but still has a bit of a bite. Stir in the chicken and cook an additional 5 to 10 minutes, or until the rice is done. In a liquid measuring cup, add the flour to 1 cup of the half and half. Whisk until the flour is mostly incorporated, then whisk in the remaining 1/2 cup of half-and half. Slowly whisk the mixture into the pot, then stirring continuously, cook until the soup is thickened and heated though, another 5 minutes or so. Remove from heat and allow to sit another 10 minutes, as it will thicken a bit as it cools. Taste and season with additional salt and pepper if needed. Divide among serving bowls, and sprinkle each serving with bacon and fresh parsley. Serve. Ugh, we are supposed to get a crapton of snow tonight, so I guess it's not spring here yet. :( Oh well, soon enough! Glad you liked the soup! Now I'm almost hoping for one more cold snap just so I can make this! Heck, I'll make it anyway. You know, I actually almost subbed quinoa for the wild rice when I made it! I definitely think you can use it, but you just may need to adjust the amount of broth. 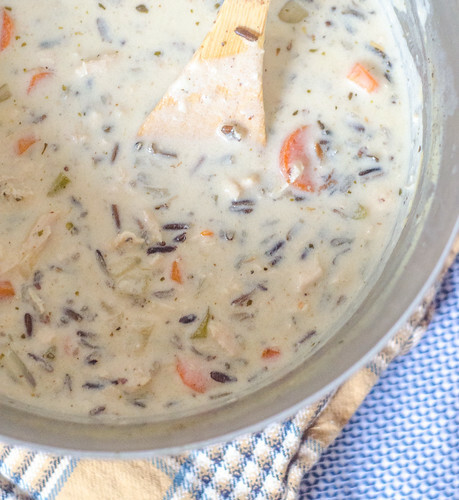 As a general rule, wild rice calls for cooking 1 cup of rice per 3 cups of liquid, and quinoa is 1 cup of rice: 2 cups liquid... so just decrease the chicken broth by a little less than a cup, then adjust accordingly to get the consistency you want. It would also simmer significantly less time - quinoa only takes about 15 minutes or so to cook, while wild rice takes much longer. Let me know how it turns out! Made this for dinner tonight at the end of a gray, chilly day. LOVED it. Definitely hit the spot.